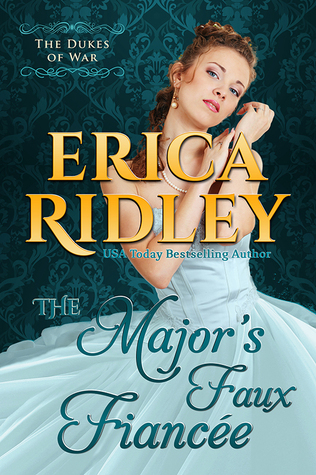 Another sweet and light Regency romance from Erica Ridley. There is something particularly sweet about two childhood friends falling in love. Major Blackwell drops everything and dashes off to come to the aid of his old friend, Daphne, the girl next door. The pair even have cute childhood nicknames for each other. Of course I was fully expecting them to fall in love and for the 'faux fiancée' element to become 'real fiancée' by the end. I just had to sit back and enjoy. I liked the characters Daphne and Bartholomew. I sympathised with Major Blackpool's issues and admired Daphne for her independent spirit but she was too rigid in her thinking for my liking. However, both characters find a way to overcome these issues by the end. I particularly enjoyed the appearance of characters from earlier in the series; Amelia and Lord Revenwood. I'm still in anticipation of a HEA for Lord Ravenwood. Katherine was a very likeable character. Maybe her doddering old aunt will play match maker. I hadn't read the blurbs for any of the books yet to come in the series so the sneak peak at the next book had me exclaiming OMG! !